For the first time as a public company, professional social network LinkedIn is reporting its second quarter results today. 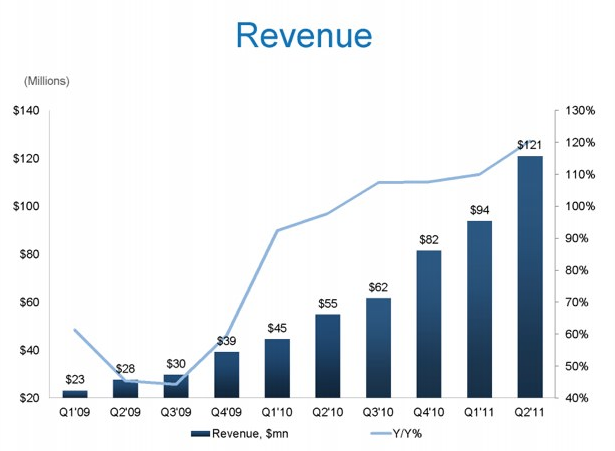 LinkedIn’s revenue for the quarter came in at $121 million, which is an increase of 120% compared to $54.9 million for the second quarter of 2010. Net income for the second quarter was $4.5 million, compared to $4.3 million for the second quarter of 2010; Non-GAAP net income for the second quarter was $10.8 million, compared to $6.4 million for the second quarter of 2010. The company blew away analayst estimates the quarter. Analysts expected a loss of 4 cents per share on revenue of $104.5 million. Adjusted EBITDA for the second quarter was $26.3 million, or 22% of revenue, compared to $11.5 million for the second quarter of 2010, or 21% of revenue. GAAP earnings per share for the second quarter was $0.04; and Non-GAAP EPS for the second quarter was $0.10. In terms of metrics, the site’s members grew to 115.8 million, an increase of 61% from the second quarter of 2010. 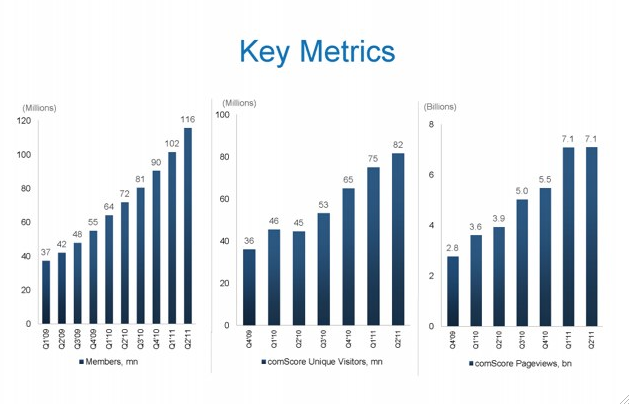 During the quarter, LinkedIn saw unique visitors of 81.8 million per month, an increase of 83% from the second quarter of 2010. Page views came in at 7.1 billion, an increase of 80% from the second quarter of 2010. Mobile page views for LinkedIn have increased approximately 400% year-over-year. In terms of the breakdown of revenue, Linkedin’s Hiring Solutions totaled $58.6 million, an increase of 170% compared to the second quarter of 2010. Hiring Solutions revenue represented 48% of total revenue in the second quarter of 2011, compared to 49% in the first quarter of 2011 and 40% in the second quarter of 2010. And the third revenue channel, Premium Subscriptions, came in at $23.9 million, an increase of 60% compared to the second quarter of 2010. Premium Subscriptions represented 20% of total revenue in the second quarter of 2011, compared to 21% in the first quarter of 2011 and 27% in the second quarter of 2010. Revenue from the U.S. totaled $82.7 million, and represented 68% of total revenue in the second quarter of 2011. Revenue from international totaled $38.3 million, and represented 32% of total revenue in the second quarter of 2011. With respect to the company’s outlook, LinkedIn revenue for the third quarter of 2011 is projected to be in the range of approximately $121 million to approximately $125 million. F Revenue for the full year of 2011 is projected to be in the range of approximately $475 million to approximately $485 million. LinkedIn probably had the biggest IPO thus far in terms of hype this year because it was one of the first big social media companies to go public. After pricing its IPO at $45 per share on the New York Stock Exchange, LinkedIn began trading at $83.00 per share on May 19, giving the company a $7.8 billion market cap. In the first day of trading, shares popped up to as high as $122.70, soaring past a $10 billion valuation. But these high stock prices didn’t sustain and LinkedIn’s value per share dropped significantly over the next month, dropping as low as $63.71 per share. However, the company’s stock rebounded in July, and shares have been trading in the range of $90 to $110 per share over the past month. That puts the company’s valuation upwards of $9 billion. But in July, the company was downgraded by one of its underwriters, JP Morgan. And some have speculated that LinkedIn’s shares are priced higher than what the company is really worth. In terms of the actual product, traffic is soaring post IPO, and LinkedIn now has more unique monthly visitors than MySpace and Twitter. The company debuted a new social ad format, and also launched a new Apply With LinkedIn plug-in for companies. Weiner says that LinkedIn is now north of 120 million members and is adding 2 new members every second, which is up from one member per second in November 2010. In Q2, LinkedIn added 14 million members.